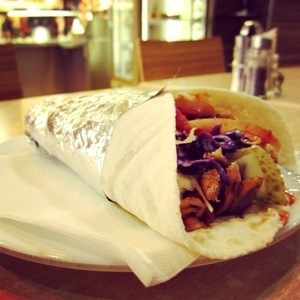 [traveling] By the time you step your feet in Europe, you subsequently become a die hard Kebap lover. I am not casting a spell over you. It’s just it, and you just have to believe me. Well, I knew Kebap; I’ve ever eaten it long before I left Indonesia, like once or twice, and nothing was special, I never thought this dish would one day be my all daily food. You said, a square meal? You mean for Kebap? Could be, and could be not. My first experience eating Kebap in France was with @tugsemylmzr , she’s a beautiful nice Turkish girl, who from the very first day had succeeded to convince me this million-dollar savvy in my life, here it is: “since it is an original Turkish food, it should be written with a ‘p’ at the end, instead a ‘b’.” Then I simply nodded. Thank you babe. And since then, this has become my savior meal in every European countries I’ve ever visited. In a way, this photo was taken in Budapest, a doner Kebap wrap with pickles in it.